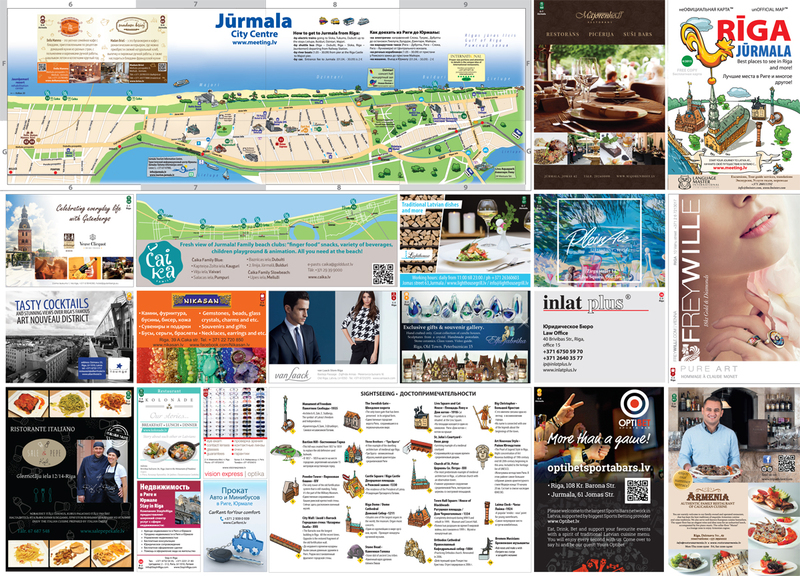 unOfficial Map of Riga and Jurmala © - Colourful, user-friendly, detailed tourist map. Published in printed form by tourism portal Meeting.lv since May 2006. One of the kind map covering tourist centre of Riga and, in some editions – the centre of Jurmala. 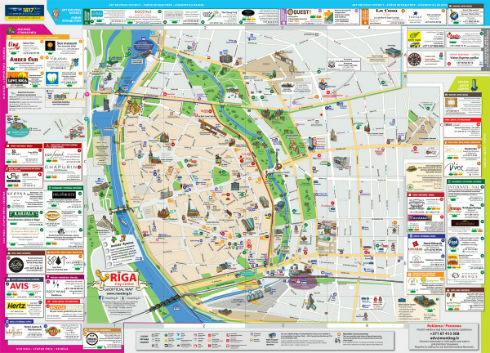 Judging by numerous comments of hotel staff and personnel of information center of Riga International Airport it is the most convenient and easily understood city map for tourists. Languages: all comments are given in English and Russian. Periodicity: it is published once in two months, 6 editions a year. Print run 15,000-25,000 each edition, depending on the season. Total year print run amounts to 100,000-120,000. Format – handy pocket format. - Folded: width - 12 cm, height - 17 cm (less than a notebook page). - Unfolded: B3 - width - 59 cm, height - 41 cm (a little bigger than two standard А4 sheets). Travel agencies, conference organizers and other interested organizations can buy maps in lots for their needs at a price of 0,20 EUR per copy. A lot contains 100 copies, with further augmentation of 100 copies. VAT included. More detailed advertising rates for current edition to be sent upon request. In unOfficial Map of Riga the scale and some distances are intentionally changed for the purpose of making the map more readable and handy. The unique street layout is an author’s product of Meeting.lv and is subject to copyright law. None of the map’s content, including fragments of the map, street layout, pictures may not be used in whole or in part without written consent of the owners. The original name - unOfficial Map of Riga – is a registered trademark (registration certificate N 58696 dated by February 20, 2008) and is protected by copyright law and trademark laws.